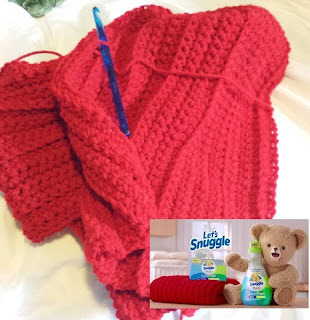 After seeing the Snuggle Super Fresh Fabric Softener commercial with the Red afghan that look so soft and cozy I had a family member ask me if I could make them one. Well, after watching the commercial on YouTube I discovered that this was a knitted blanket and I would have to come up with my own crochet version of the Red Beauty. Originally I was going to crochet this in one solid red yarn but I changed my mind and crocheted using two different red colors of yarn. You can use whatever color you would like to crochet your snuggly soft afghan from the free pattern below. Note: I would suggest using one brand of yarn the Red Heart and Caron yarn were different weights and I had to make modifications to my afghan. Either use just the Red Heart or just the Caron Yarn not both unless you are good with working two different weight yarns together in afghans. Repeat rows 1 through 3 until you have a blanket measuring the size you want about 60 to 72 inches long. Finish off by SC two rows and add a SC border around if you wish to complete the afghan. 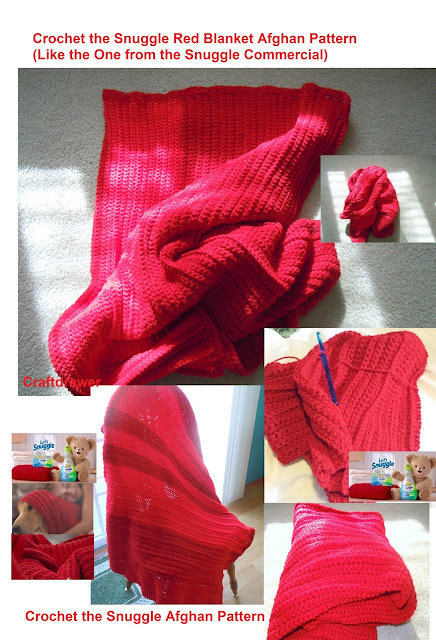 The trick is crocheting the third row in the back loops of the chain only in order to make this look more like the Snuggle red afghan like seen on television. You can make this afghan as small or as large as you want to snuggle in. A worsted weight yarn works the best but as with any crochet you can use your imagination and try different yarns and hooks to see what looks good for your project.